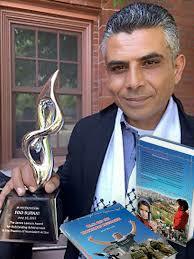 Iyad Burnat leads Bilin’s non-violent struggle in the occupied West Bank. He is the head of the Bil’in Popular Committee against the Wall, and has led non-violent weekly demonstrations since 2005 against the Israeli West Bank barriers. Iyad is also head of Friends of Freedom and Justice in Bil’in, a pro-Palestinian organisation with the stated aims of building a “wide network of people from all over the globe who support Freedom and Justice for all”. Iyad gave an inspiring keynote talk at our 2017 Annual General Meeting in April. We have copies of his book for sale at £10 each. If you’d like to purchase copies, please contact us using the ‘Contact Us’ link at the foot of this page.